We have seen a number of smartphone-controlled camera trigger devices enter the market in the last three years or so and it seems we will soon have another, very feature-rich, option if the CamsFormer Kickstarter campaign is successful. Given it has already reached almost 75% of its $7000 funding goal at 57 days to go we can assume it will be. CamsFormer plugs into the USB and cable release port of your camera or flash and is controlled wirelessly from a smartphone and tablet. It can trigger up to two cameras and two flashes using built-in sensors and allows you to remotely view and change a range of shooting parameters on your camera. You can also view the camera's live view image on your smart device, use time-lapse and intervalometer functions and even use a scripting-language to program your own customized triggering rules. 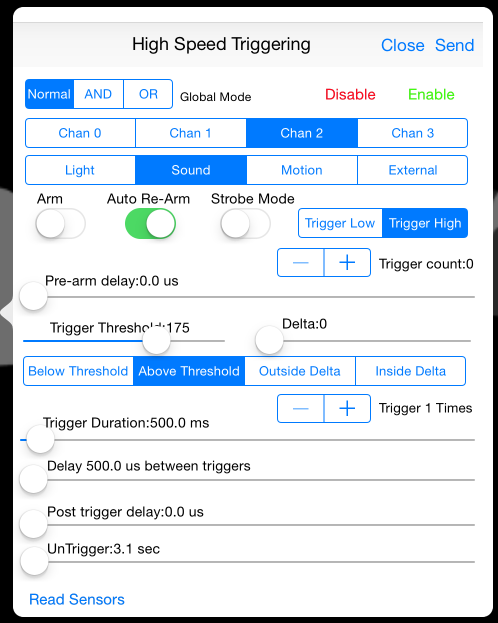 The CamsFormer mobile app offers a plethora of trigger settings. Built in sensors include light, laser, lightening, sound, and motion and you can expand the feature set by attaching a range of external sensors, such as temperature, pressure, touch or ultrasonic. In addition CamsFormer is capable of wirelessly controlling a motorized 3-axis pan, tilt, zoom head, allowing you to move your camera remotely or via a scripted procedure. Smartphones or tablets are connected to CamsFormer via the latter's own Wi-Fi network, so no Wi-Fi or wireless connection has to be available at your shooting location. Shipping is expected to start in June 2015 and backing options start at $149. Have a look at the project's Kickstarter page for further info and a video that shows the CamsFormer in use. The device is also capable of controlling motorized 3-axis heads. This sample image was captured using the sound sensor. Camranger is a waste of money. If you have a nikon a canon you can just pick up the plink wr-3040 for $30 on amazon, flash the modded version of open wrt, download DSLR dashboard, and you get most of the functionality for 1/10th of the price. I like the idea of this products, but the difficulties that trigger trap have been having with their "Ada" sensors makes me think that this is going to be very difficult to achieve by a 1-man-in-his-shed kind of operation. I also have more confidence in the build quality and support from trigger trap. I hope he does pull it off though, more competition is always a good thing. I'll see how my set of Ada sensors work when they finally arrive! Interesting, but how is that going to physically connect to the camera? Quite easily. Electronically via the USB port on Nikon cameras and mechanically as shown in the picture above but I am sure that there are even more elegant solution possible. And it works really fine. And how do you propose to connect sensors to MR-3040? It's just router. Nice, cheap, useful, with custom firmware... but it's no trigger controller. 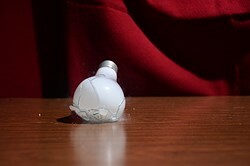 I would use triggertrap for the sensor as I am pretty confident that they will be far superior. 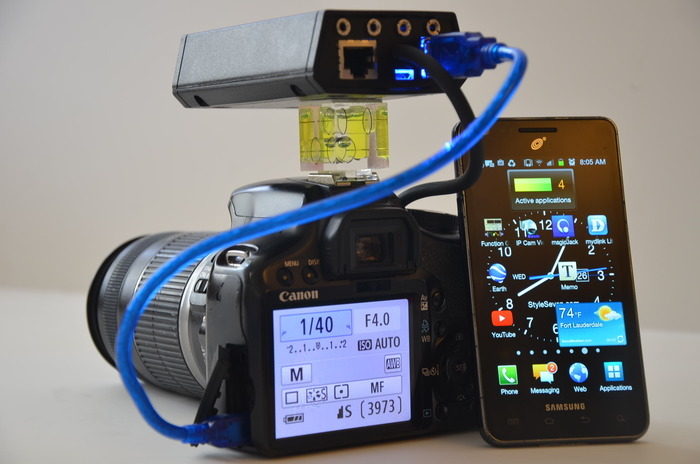 if I can get jpegs to output to my tablet over wifi while the triggertrap triggers the shutter, I will be happy. Being able to change the trigger settings over wifi would only be of marginal benefit to me. Corny "commercial" too... doesn't make me want to buy this beast of product... and my camera isn't slow.. just my reflexes... your product isn't speeding up my camera!!! It boggles the mind that it had to be that huge. This clearly work of technical programmer. They intend to make horrible interfaces and use technical terms like everyone knows them. I'm very happy with my Triggertrap. was thinking the same thing.. though for an early prototype to gain money - I think its just fine. UI enhancments can easily be changed once funding goal is reached and hardware is solidified. Wouldn't be concerned about that, just don't move them on your iPod. 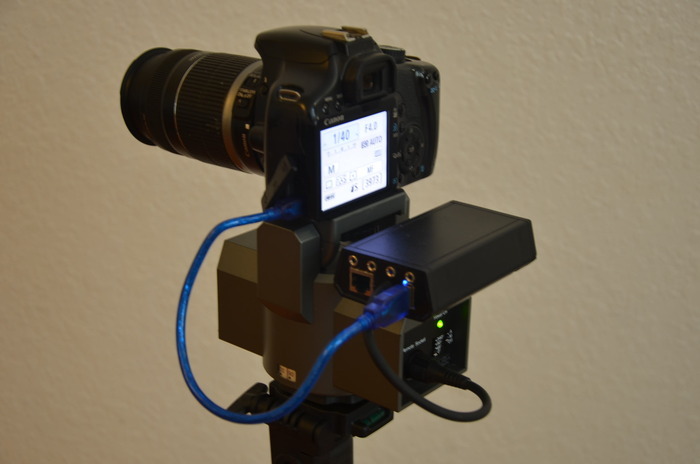 This seems to have the functionality of a CamRanger on steroids. Given the price, there's a question in my mind of whether the motion, sound, light etc. sensors have the quality needed to perform consistently. If it's a rock solid device, it could appeal to pros. But when you watch the video on Kickstarter, is clear that the inventor is aiming for the amateur market, at a price amateurs would pay. And the video is a bit over the top in its wild-eyed enthusiasm for what are admittedly some really interesting features. If they all work properly and keep working. The Pentax FLU card does cell-phone camera operation also, and with adjustable shooting parameters. The live view relay is pretty cool and I like how it can control flash but the device only supports Nikon and Canon cameras. And Android version is still being worked on (even though they shown a Samsung phone above). It's supposed to ship in June next year, so there is still time to work on stuff. This device only supports Nikon and Canon, because they are extremely slow cameras. OMG, that UX! It BURNS.